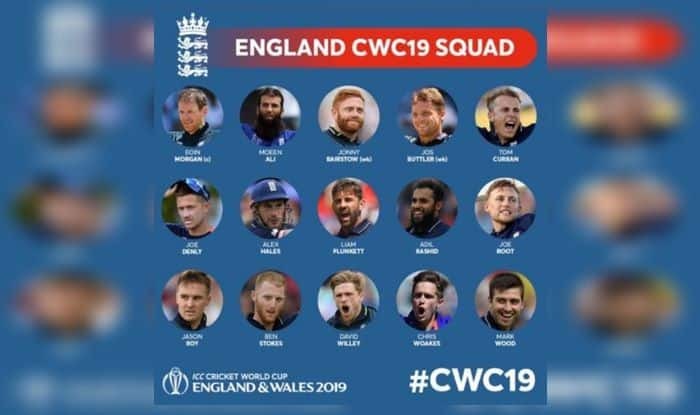 England Cricket Board on Wednesday announced the 15-member squad for the forthcoming ICC World Cup 2019. The England Cricket Board on Wednesday announced their 15-member squad for the upcoming ICC Cricket World Cup 2019. Swaying away from any sort of potential experiments, the selectors have opted to go with a squad which has been tried and tested. They include the likes of Jonny Bairstow, Jason Roy, Alex Hales, Joe Root, Eoin Morgan, Ben Stokes, and Jos Buttler make for a settled line-up. Rashid and Moeen Ali will be the main spinners, with Denly and Root’s part-time spin supporting them. Hosts England will start outright favourites as they have sound know-how of the conditions. England has picked both Moeen Ali and Adil Rashid as was expected. Jofra Archer is another big name that seems to have missed out. Eoin Morgan (Middlesex), Moeen Ali (Worcestershire), Jofra Archer (Sussex), Jonny Bairstow (Yorkshire), Jos Buttler (Lancashire), Tom Curran (Surrey), Joe Denly (Kent), Chris Jordan (Sussex), Alex Hales (Nottinghamshire), Liam Plunkett (Surrey), Adil Rashid (Yorkshire), Joe Root (Yorkshire), Jason Roy (Surrey), Ben Stokes (Durham), David Willey (Yorkshire), Chris Woakes (Warwickshire), Mark Wood (Durham). Eoin Morgan (Middlesex), Jofra Archer (Sussex), Sam Billings (Kent), Tom Curran (Surrey), Joe Denly (Kent), Chris Jordan (Sussex), Alex Hales (Nottinghamshire), Liam Plunkett (Surrey), Adil Rashid (Yorkshire), Joe Root (Yorkshire), Jason Roy (Surrey), James Vince (Hampshire), David Willey (Yorkshire), Mark Wood (Durham).